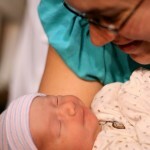 Ezekiel Ryan was born at 12:02am Thursday September 30, 2010. He weighed 7lbs, 9oz and was 20.25 inches long. Wednesday afternoon (the due date) we had our last check up and I was dilated 3cm and 80% effaced, and my doctor went ahead and stripped my membranes. That was at 1:00pm. 2:30pm I started having some uncomfortable contractions and after a Wal-mart run I started timing my contractions right away to see if I was in actual labor or not. I called the Birth Place around 5:30pm because the longest time between my contractions was 6 minutes, which had only happened twice in the last hour, and some of them were coming as close as 2.5 minutes. The nurse told me to not come in yet, but soak in the tub and lay down and see what that would do for the contractions. Tim had a junior high small group to lead from 6:30-8pm, so I sent Hannah with him to play in the nursery so I could labor at home. There was no way I’d be able to entertain and work with Hannah while trying to labor. I soaked in the tub for a good while, until I really couldn’t handle the pain any longer. Soaking seemed to make my contractions hurt worst, so I moved to the couch to watch the last half of Biggest Loser that I had started earlier during the day to hopefully get my mind off of the pain. While soaking and laying down my contractions hurt a lot worst, but they became more consistant coming about every 5 minutes and lasting almost a minute at that point. After the show was over I started walking around again to cope with the pain and the contractions jumped to coming every 2 or 3 minutes, but only lasting about 30 seconds. When Tim and Hannah got home around 9:00pm I had him keep Hannah up as I called the Birth Place again to see if I could come in and see what was going on. The nurse didn’t sound convinced that it was true labor ’cause my contractions were getting sporadic again, but I decided to go in anyways because of the pain I was in. I called Robyn and arranged for her to come get Hannah for the night, and said bye to our hyper and excited little girl around 9:45pm. We got to the hospital a little before 10:00pm. I had a contraction on the way in through the hospital door, got in the wheel chair to be taken to the Birth Place, and worked through a contraction on the way, and then had another one a couple minutes after getting to the room. They were all set to check me in a small room and send me home, but after that last contraction the nurse said they were going to move me since that sounded a little more serious than they were expecting. They checked me out at I was at 5cm and in full labor. 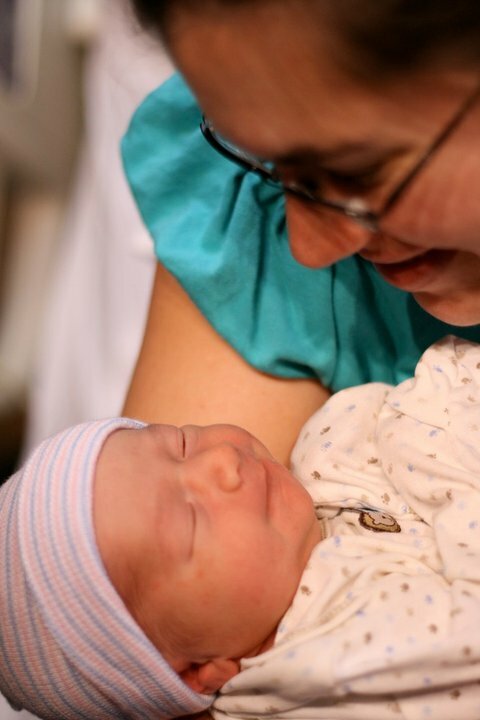 Our nurse worked quickly at getting everything set for a fast delivery, saying she was expecting Zeke to come before 11:30pm when her shift was over. I asked if she was kidding, and she said no, things are moving along. 10:30 I was checked again and was dilated 8cm. My doctor was called in and she started talking options to deal with the pain because they weren’t sure the anesthesiologist would make it to the hospital in time. With my luck she walked in during the conversation! I was really hoping for an epidural after not getting one with Hannah and being completely sore afterwards because I couldn’t relax at all through her contractions, even after reading book after book on different relaxation tips and practicing. I didn’t get an epidural, but they did give me a spinal block that would last an hour, since apparently, that was all the time I needed. Labor slowed down a little bit, which was good, and at 11:45pm it was already time to push. 12:02am little Zeke was welcomed into our world! With being born after midnight I had the option to stay until Saturday. I contemplated going home Friday because I was feeling pretty good, and my mom was in town by then, but our nurse Mary (A very sweet lady from our church.) at the time talked me in to taking advantage of one more night in the hospital, and I’m glad I did because I was feeling a lot more confident about going home after another night’s rest. Zeke is doing great. Nursing is going way better with Zeke than it did with Hannah. Zeke lost 4 ounces after his first day of life, and only 1 ounce on his second, which made his doctor very happy to know especially after the difficulties I had nursing Hannah. This time I’m a lot more relaxed and was a lot more intentional about learning how to make sure I was nursing correctly. And this little man loves to eat! Being home is nice. It’s going better than I expected. Hannah loves to give Zeke kisses and just look at him (or poke him). My mom is a huge help with chores around the house and keeping Hannah occupied while I take care of myself and Zeke. Hannah doesn’t seem to mind all the time I’m spending with Zeke instead of her since she has her daddy and grandma to give her lots of love and attention. We get our play time in, it’s just not as long right now. Continue to pray for us through this transition. Pray for Tim as he is already back at work after the weekend. I know he would much rather be spending time at home with all of us and taking in these first few days of Zeke being in our arms. Pray for Zeke and I that nursing will continue to go well. We’re still on the learning curve, but making adjustments and figuring things out is going well being patient about it. Pray for my mom that she wont get worn out helping us, and my dad as he flies up tomorrow night. Pray for Hannah as her world doesn’t revolve around just her any more. Praying for all your requests Dana! I had the same thing with the nurses wanting to send me home and a couple hours later I had Jace. If I would have went home I most likely would have not made it back there to have him! Glad your little guy is finally here and in your arms! So happy for you! Zeke is a cutie!!! Praying!!! Congradulations! Zeke is absolutely beautiful and is already the topic of several discussions down here in East Texas! His great-grandparents are certainly bragging! You should hear them! We love ya’ll. Can’t wait to see both Hannah and Zeke in person! We are proud of you.